Recently the British government has announced plans to abolish the Anti-social Behaviour Orders (ASBOs), which were introduced in England and Wales under Labour Prime Minister Tony Blair in 1999. They were aimed at banning an individual from engaging in specific kinds of behaviour or going to certain places. Breaching an ASBO could result in a criminal punishment of up to five years in prison. The ASBO promised much but, in the eyes of the new British conservative government (installed in 2010), has delivered little. With the ASBO, the idea was that one could stop young offenders in their tracks before they became career criminals. People clearly liked the theory, but the problem turned out to be in the actual practice. British Ministry of Justice figures show that 55% of the almost 17,000 ASBOs issued between June 2000 and December 2008 were breached, leading to an immediate custodial sentence in more than half of the cases. (Home Office, 2010, as seen on BBC news, July 28, 2010). 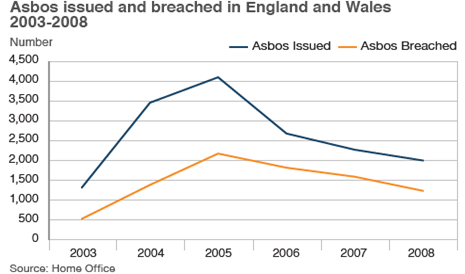 In reaction to these figures, the Home Secretary Theresa May, suggested an end to the use of ASBOs in favour of the 'community-based' social control policies that were popular in the past (BBC news, 2010). May said punishments should be ‘rehabilitative and restorative’ again, rather than ‘criminalising’. In the Netherlands the line of approach is completely different. Here, the repressive measures have not been abandoned. On the contrary, in November 2010 the right-wing government introduced a new bill extending the period of restraining orders imposed by a judge for Anti-social Behaviour (ASB) from three months to two years. So, although in both countries new conservative governments were installed, their political rationales are diverse in character. While the British Conservative party focused on returning to old-fashioned policies of a rehabilitative nature because of the criminalisation effect of the repressive measures, the Dutch cabinet still believed in a more repressive approach to tackle ASB. In reactions in the media (November 2010) the Minister of Justice and Security Ivo Opstelten defended the new law with the argument ‘the government must show their capability to control crime’. An explanation for the recent divergent developments - between the Dutch and British crime politics - could be that the so-called Culture of Control in the UK is changing simply because it started earlier. In crime policies, such as in other societal developments, several successive and sometimes ambiguous trends can be identified. Within criminology, long-term alternating conjunctures from repressive to more lenient approaches to crime have been observed, also referred to as control waves. In general, a period of lesser control develops in juxtaposition to the preceding decade of strong crime policies. Perhaps the UK, often being the trendsetter for Dutch politics, is an early adapter of this ‘softer’ style. Various scholars identified a tendency among Dutch politicians to swiftly pick up novel trends from abroad. If this is indeed true, then softer crime policies can be expected to be on the rise soon in the Netherlands as well. Possibly after the elections in September a tough approach to crime will be completely out of fashion. More or less aliens in prisons?